Edwin "Thorpe" Romero, chairman of the Barona Band of Mission Indians, was recently named one of the region’s most influential people because ofhis passion for the welfare of his Tribe, as well as the entire San Diego community. San Diego’s Top Influentials highlights the Who’s Who in San Diego business, profiling the top newsmakers of 2009. Thank you to all who attended the reception, held at The Daily Transcript's offices on Feb. 22, 2010. Public works will be the bright spot and homebuilding the weakest sector in the 2010 construction economy, experts said. The effects of the slumping economy have been felt in virtually every industry throughout America. The downturn has touched sectors as diverse and wide-ranging as education, hospitality and health care, and slump is expected to continue in 2010. 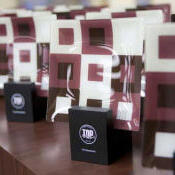 Whether the discussion is about the residential or the commercial market, 2009 was a rough year. How 2010 will look is open to interpretation. San Diego County Credit Union is San Diego's largest locally based, full-service financial institution with a successful track record of serving customers with all their financial needs. Originally chartered in 1938 as San Diego County Employees Credit Union, SDCCU was formed to provide for the financial needs of local county government employees. During the 1970's, SDCCU expanded its membership to include all San Diegans. Today, anyone who lives or works in San Diego, Riverside and Orange Counties is welcome to open an account. This time last year, nearly every industry in San Diego was holding its breath waiting to see what 2009 would bring economically. The San Diego legal community has weathered the economic downturn better than other regions, according to local law firm officials. The economic outlook for the next year is much improved, which is good news for San Diego business. What a difference a year makes. The mood on Main Street and Wall Street at the end of 2008 was bleak, to say the least. 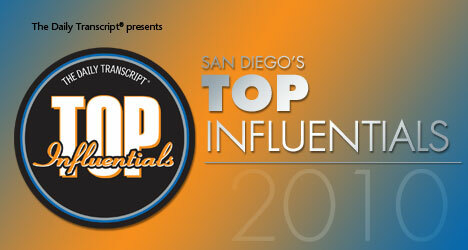 Welcome to the 2010 edition of San Diego's Top Influentials - SourceBook. This annual publication is filled with valuable information and data about viable San Diego County market segments. Being a leader comes naturally to Robert Valderrama. He was in a club called the "sociables" at Sweetwater High School, where he was chosen as the president amongst all his peers. San Diego native Tom Wornham isn't the type to sit by and do nothing -- especially when it comes to his hometown's economic development. Andy Berg is a man that looks out for his contractors and for his community. As more companies struggle to clear economic hurdles and turn a profit, employers anxious to dodge costly lawsuits by disgruntled former employees may want to consider what Amy Wintersheimer Findley has to say. When Edward Kaen decided to venture into the world of hospitality, he wanted to do it right. Success is not something a person can achieve on his own. Tee Ness, president and chief executive officer of Hawthorne CAT, says he got into the business the easy way. The ability to define the result of months of work in the accomplishment of a single project is what Jim Roherty, president of Pacific Building Group, enjoys most about the construction business. South of Ramona and north of Lakeside, the rocky, rolling hills create the backdrop for the Barona reservation. Large tan boulders break up the green hills, smooth from thousands of years of weathering the elements. He advocates a multi-faceted approach to wellness for his employees, but Victor Buzachero has a single-minded purpose for staying fit. When Larry Anderson took charge at Tri-City Medical Center last year, he took on some daunting challenges. For Channey Doud and Dynalectric San Diego, 2009 was a year of transition and diversity, as the company went from having a say in the private market to persuading the public sector. In late 2008, Soltek Pacific Construction positioned itself well, allowing the design-build firm to be an influential player in the military construction market in 2009. Just because DPR Construction Inc. Regional Manager Jay Leopold may not belong to construction associations or lobbying groups doesn't mean he's not influential. Pat Caughey joined the firm of Wimmer Yamada in 1984, working in the Phoenix branch for three years before coming back to the main office in San Diego. He became partner in 1995 and the firm was renamed Wimmer Yamada and Caughey (WYAC). With foresight, tenacity and a lot of hard work, Jamie Awford has managed to grow the San Diego office of Turner Construction -- even amidst the most pervasive economic downturn in decades. Donald Ankeny, San Diego-based Westcore Properties president and CEO, oversees about 9 million square feet of industrial, retail and office space spread from San Diego to Switzerland. About 2.5 million square feet of this mostly industrial space in Southern California. Staying diverse, adapting, and retaining customers and employees have allowed Neal Electric to prosper in the construction business for the past 25 years. Barnhart Inc.'s management strategy positions the company to weather even the most tempestuous economy. Over the years the company has ensured it is well diversified and kept its staff lean even during boom years -- moves that have been the key to success for the company, said Eric Stenman, Barnhart president. Jim Spain, the managing director of Colliers International's San Diego region, oversees 78 broker professionals in the downtown San Diego, Carlsbad, UTC and Temecula markets who combined had nearly $600 million in sales and leasing volume last year. Growing up in Los Angeles, Frank Marquez was exposed to the construction industry at an early age. When he was about 7 years old, he started job shadowing his dad, thanks to his father's boss. Construction is in Diane Koester-Dion's blood. Growing up in Southwestern Illinois, Koester-Dion's family ran a grading company. She has remained rooted in the industry, despite transplanting herself to a new region and market sector. Dennis Hearst, a Cushman & Wakefield senior director, insists that doing everything possible to stave off commercial foreclosures could end up doing much more harm than good. Seldom do aspiring pediatric neurologists envision a career in which they will facilitate construction projects, manage district pharmacy and supply-chain services, and oversee facilities maintenance and security. David Tam, however, did. Gail Naughton is a very busy woman.